8th April 2018 I ran my first Manchester Marathon. It wasn’t my first marathon distance race, I’d done five London Marathons in the past but my last marathon was nine years ago. In the intervening nine years I had lost my love of running and my focus instead had been on building my career, getting married and having two children. Then in July 2017 I realised that I was in the last year of my 30s and I wanted to try and get as fit as I was when I turned 30. This was not going to be easy. Before marriage and children running had been a huge part of my life. I had a much less demanding job and my social life at the time revolved around the running club I was a member of. I knew that I could pull off a 10k without much training so I wanted something that was going to keep me focussed on improving my fitness and would take a good few months of work. Therefore on that July evening I entered Manchester Marathon 2018 as well as the Three Peaks Challenge which I am due to undertake in a few weeks time on my 40th birthday weekend. Why Manchester? Well, I wanted a spring marathon around the same time as London so there would be lots of fellow runners going out for those long winter runs at the same time as me. My husband is from Manchester so we would have somewhere to stay and family members to look after the children. I was also attracted by the description of “flat” and that there would be good crowd support. This was important to me as having only ever done London Marathons I was used to huge spectator support and know that this has helped me when the going got tough. So, I set about training with no specific plan in mind other than I wanted to run 4 times as week with one of those sessions being a long run. I planned to be up to 13 miles distance by the end of the year and would then increase my long runs by a mile or two a week so that I would work up to doing three 20 mile runs, the last 20 miler being two weeks before Manchester Marathon. I was very much just ‘winging’ it and making it up as I went along. I joined Sandhurst Joggers in January so I could train with other like mined people although what I did find was I preferred to do my long runs alone so there was no pressure to run a certain speed. I was fortunate enough to totally avoid injury (which I never managed before so when I was younger maybe I was over training?) and despite the rubbish weather and crazy hours at work I kept to my vague idea of a plan. I did many of my runs at 5:30am so then if I got stuck in work it wouldn’t matter, some runs in the middle of the night when I was working a night shift and even the snow didn’t stop me as I was able to run as the snow was falling and hadn’t iced over. What was my goal? I told most people that it was just to finish it but I secretly wanted a sub 4 hour. All of my previous marathons apart from one had been sub 4 hours but I was also conscious that my circumstances had changed and I was older. The times of my long training runs suggested that sub 4 hours would be possible but it would be tight. Marathon day. I woke up to perfect running conditions. Overcast and around 8 degrees. I set off from my mother-in law’s house at 7am and got on the tram which took me direct from her house to the start line within an hour. After taking a few photos and joining the toilet queue on more than one occasion I was able to easily get to the front of my starting pen Within 5 minutes of the start I had crossed the start line. This was all a huge improvement on London where it takes ages to get in and then you have so much hanging around. There was no stop starting and trying to run around slower runners, if anything I had started with much faster runners. I completed the first mile in 8 minutes 11 seconds and felt brilliant but was aware that this was far too quick for my plan of sticking to 9 minute miles. I had a bra emergency in mile 2 and had to stop briefly to sort myself out but still completed that mile in a similar time. I kept telling myself that I needed to slow down but I just couldn’t. I felt great. So I decided to scrap the plan and ‘wing it’. I thought I would keep going as I was and hang on for dear life when things got tough. I hoped that it wouldn’t blow up in my face and that I wouldn’t regret being so risky over the marathon distance. What I did know from the five previous marathons I have done is that marathon distances suit me. I have good stamina and mental resilience and once I get into a pace I can usually keep it up without slowing down too much in the second half. I think it was mile 9 when I got to a stretch of road where the fast runners pass you on the other side. 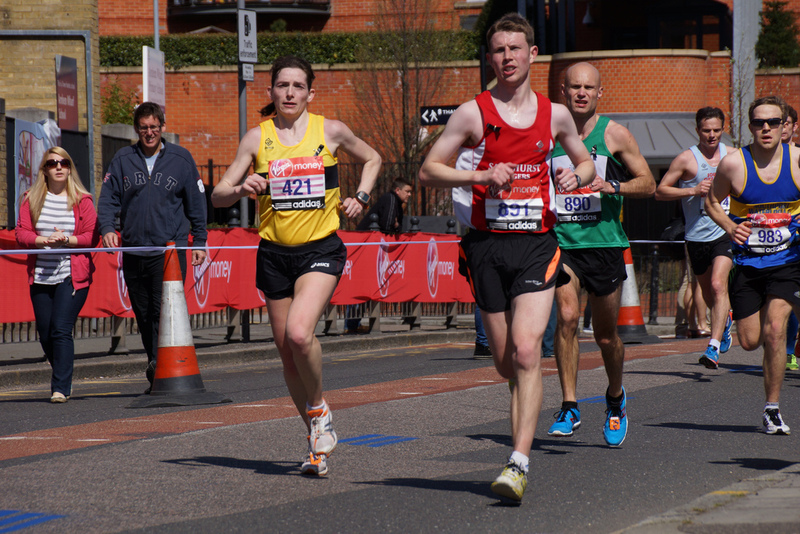 This distracted me for a while as I marvelled at the lead runners and kept my eyes peeled for the lead females. At 16 miles I saw my dad and husband for the first time. They gave me a big cheer and I remember my husband shouting out that I was going to smash my 4 hour target. After seeing them I felt a little emotional especially as I was beginning to feel really tired and realised that I still had 10 miles ahead of me. I started to have a little cry as I ran which lots of spectators saw. The next thing I knew, loads of people were cheering me on and shouting my name. I soon pulled up my big girl pants, got myself together and the smile returned to my face. I continued running well under nine minute miles until exhaustion and heavy legs started to hit at around mile 23. It was then that I dropped back to what I had planned to be my marathon race pace. Mile 21 to 24 felt long and lonely with not so much crowd support in this area and not much to look at other than fields and cows. I felt sick and could not stomach any more of my gels. It was at this point that I also realised that even if I slowed down significantly I would still come in under 4 hours. I just got my head down and concentrated on putting one foot in front of another, with each step taking me closer to that finish line and the post marathon high I knew awaited me. As well as a lovely bottle of prosecco! I crossed the finish line in 3 hours 46 mins and was over the moon with that time. I was able to quickly find my Dad and husband and within an hour of me finishing we were in Manchester city centre and I was drinking the prosecco I had been promising myself. When I thought about things later , whilst I was happy with my time, there was a tiny part of me that thought, if I had only pushed a bit harder in those last few miles I may have got a sub 3 hours 45 minutes Good For Age time…. However that was never my target. Sub 4 hours was the goal and I smashed that one. So I may well be back at Manchester next year, chasing that sub 3 hours 45 time after following a proper and targeted training plan now that I am member of Sandhurst Joggers.